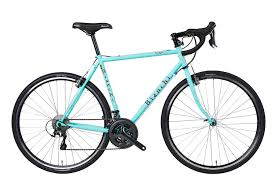 Description: Bianchi's Volpe is an extremely versatile, go-anywhere road and path bike. It's equally at home on pavement and dirt roads; ready for a fast, short rides, and capable of fully-loaded, long-distance touring, too!Full Size fenders,front and rear racks can be installed on this bike. Its lightweight chromoly frameset. The wide-range gearing and super-smooth shifting let you cruise over any terrain, while the cantilever brakes deliver fine stopping power and super mud clearance. Plus, the grippy 700 x 32c tires mounted on reliable WTB/Shimano wheels mean you can even hit the occasional trail with confidence. at the manufacturer's request we are not permitted to ship it until you visit our store. Then we can ship. It can be picked up in our store at your convenience, or we can pack your purchase for you to travel with it.